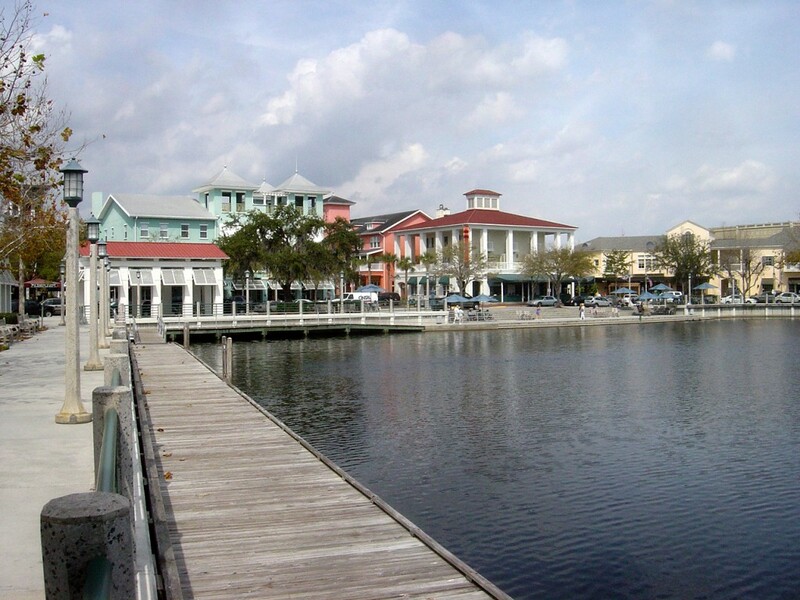 Celebration, Florida is a residential master planned community that was originally designed by the Walt Disney company in the 1990’s. The community was designed to create an old-fashioned, tight-knit neighborhood feel with many areas resembling the 1940’s or 1950’s period. Celebration has public and private schools, a hospital, a post office, churches, a golf course and a downtown area with shopping, restaurants and a boutique hotel. The town consists of eight developments: Celebration Village, Lake Evalyn, Roseville Corner, Artisan Park, North Village, South Village, East Village and the West Village. These villages have homes consisting of several different types of homes ranging from apartments, condominiums and townhomes to single family homes and spacious estates. One of the most noticeable features of the Celebration design are the large front porches on most homes and garages are in the rear of the property. This was designed to get neighbors out talking to each other to create a feel that’s old-fashion and very welcoming. This is further encouraged through the use of wide sidewalks that invite residents to get out and meet each other. Celebration also hosts a variety of social events throughout the year, including community-wide yard sales, an art show, an exotic car festival, an Oktoberfest Celebration, the “Great American Pie Festival” and downtown events for the Fall and Christmas seasons when autumn leaves and “snow” are released into the Town Center. The community also hosts a large Independence Day fireworks celebration. Homes for sale in Celebration range from $140,000 to over $3,000,000. Celebration is a great place to live, raise a family, work, play golf and enjoy all of what Central Florida has to offer. If you would like to talk to an Realtor in Celebration, Florida real estate contact us online or call us at 888-588-6354 and let us help you with all of your real estate needs.